Well in 2 days it will be 2015! It has been quite a year and I seriously have no clue where it went. It has been a year of ups and downs, but like always we made it through. I have been glued to the sofa the last few weeks...first with the flu and bronchitis and now with severe back pain and chronic headaches, so I have had lots of time to reflect on 2014 and contemplate about 2015. Despite a few issues in 2014 (like ongoing car and health issues) we had a great year overall. We accomplished a lot and have so much to be thankful for. My "word" last year was persevere and I am happy to say that I definitely persevered in 2014. I also had a major break through this year and was much better at going with the flow, rolling with the punches and trusting that everything will always work out in the end. I learned that I cannot control what tomorrow will bring and that it is better to live in the moment, rather than trying to plan out and control every detail of life (now if I could only get my children on board with that way of thinking). And I have learned (with my husband's help) that I must slow down a little bit and that I cannot do it all...darn I totally thought I was supermom! 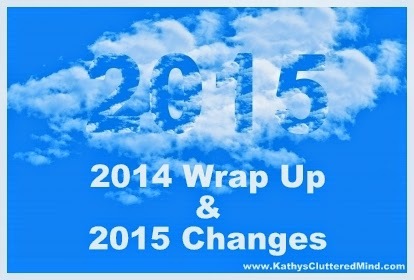 So now that 2014 is wrapped up let me tell you about some changes we are making in 2015. First up blog changes! I am no longer doing reviews for The Old Schoolhouse Review Crew and I am no longer handling social media for A+ Interactive Math, which has freed up some time for me and taken away a little stress. Because of our crazy, on the go year my blog suffered. I took on more than I could handle and got very behind, which left me no time for sharing my personal thoughts and passions. My blog became inundated with reviews and sponsored posts, which you will be seeing fewer of next year. When I had a free day to write a non-sponsored or non-review post I had writer's block. Seriously, I couldn't not think of anything to write about that I had not already written about...I guess that is what happens when you hit 1,000 posts. And I become obsessed with my blog stats. I initially started my blog as a way to share about our homeschool journey and I would like to get back on that track. My passion has always been helping others in the homeschool community and I hope to one day write a book or become a speaker...a girl can dream right? A big piece of our journey (which I am sure you have noticed) has been a switch to unschooling and roadschooling. Sure there will still be some curriculum posts and maybe a sponsored post once a month, but they will not be as frequent as they have been...I promise. I am very thankful to have you as a reader and hope you will stick around in 2015! If there is something I used to share about that you miss let me know in the comments! Here are the 10 posts for 2014 that had the highest views. One of the many joys of homeschooling is that we can easily change up learning styles and homeschool methods whenever we want. Over the last 4 years I think we have tried just about every homeschool method/style there is. Some have worked better than others and of course there is never a wrong method/style because it is totally dependent upon your children's needs...the unschooling method seems to work the best for our family. This year though we were pretty much roadschoolers. We squeezed in 4 + fieldtrips a week and even got to take two fun family vacations (which of course included lots of learning). But as fun as fieldtrips are they can be quite exhausting. So next year we are going to only do 2-3 fieldtrips a week. The children requested we stay home more so we could go back to daily read alouds, hands on projects, and exploring of passions and interests. I think my son just wants to stay home so he can play on Minecraft 24/7. Every year I swear I say we will get more organized...this year I really mean it! I have joined this fun Declutter 365 Challenge in hopes of getting a little more organized around the house! For over 6 years I have had ongoing health issues which have had me in and out of doctors. I have lost all hope with traditional medical doctors so I have been trying to get to the root of my health issues with the help of holistic chiropractors. After visiting 2 chiropractors this year that provided no relief, I finally found one I liked and as long as I saw him 3 times a week, stayed on my expensive vitamins and ate right I seemed to be getting a little better. However finances became tight and the trek to his office (over an hour away) multiple times a week became too difficult and I started to regress. The other night...while up at 3 a.m...I researched holistic chiropractors in my area and found one that I will hopefully be seeing in a couple weeks. I am determined to get myself healthier in 2015!!! My children and husband deserve a mom and wife who is healthy and happy again! I have one more quick thing to mention before you go. Facebook has yet again been making more changes! If you follow us on Facebook then you know I not only share new blog posts on our page but also homeschool freebies, deals, inspiration and more. However come January you may no longer see these posts. To make sure you don't miss anything I have created a new group on Facebook called Homeschooling and Unschooling Frugally. Please feel free to join so you never miss anything from me and so you too can share resources, freebies, etc. Also don't forget to Subscribe to Kathys Cluttered Mind. We hope that you have an amazing 2015!